Ronald Reagan was not the only President of the United States who was an actor before entering politics. 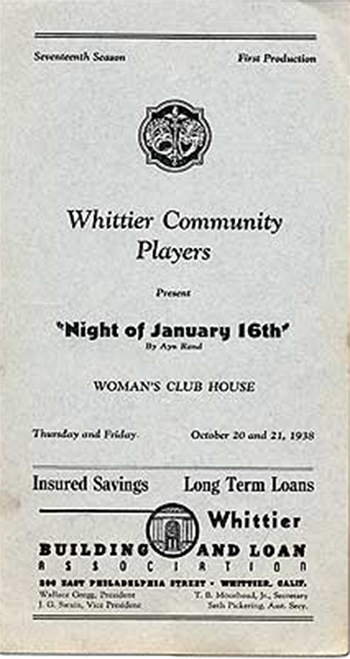 On the evening of October 20, 1938, Richard M. Nixon, a year after being admitted to the bar and thirty years prior to his election as POTUS, trod the boards as District Attorney Flint for the first of a two night run of the Whittier Community Players' production, staged at the Whittier Woman's Club House, of Night of January 16th, Ayn Rand's courtroom drama, her first play and a hit on Broadway during the 1935-36 season. This was the amateur Master Thespian's first bite at potential stage stardom. Later in the year, he co-starred with Thelma "Pat" Ryan as the leads in the Whittier Community Players' production of George S. Kaufman and Alexander Woolcott's mystery-melodrama, The Dark Tower. Following the standard script, the two actors fell in love. On this night (October 20, not January 16th), however, Nixon limned the role that he would wear as a political mantle, that of a D.A. whose traditional values drive him to prosecute the alluring, independent, atheistic flouter of social standards, Karen Andre (Rand's stand-in), for murder as much for her offense to the social order as her guilt. The spokesman for the future Silent Majority found his voice in the character, his acting experience preparing him for the second of his six crises (the first as snake pursuing Alger Hiss), his 1952 role as Vice-Presidential Candidate up against the wall to face dastardly charges of corruption. It was a heart-rending portrayal capped by the schmaltz-shmeared Shakespearean monologue known as "the Checkers speech" in which he wept havoc and let slip the pooch of war to vanquish his enemies, succeeded, and definitively proved that in politics a honey-baked ham can make it to the big time. In politics, as well as strip-tease, you gotta have a gimmick. And in dramaturgy, too. Rand's contrivance in Night of January 16th was to have the play's jury chosen from each performance's audience and let them decide the play's ending, "guilty" or "not guilty." Further, Rand left the ultimate truths ambiguous, leaving it up to the actors to decide whether their characters were lying or being honest. - another nod to politicians who often don't know whether they're honestly lying, lying about being honest, are actually honest, or honestly don't know the difference. The reviews for this production of Rand's Night of the 16th are lost to history; we don't know whether Nixon laid an egg or, as Ruby Keeler in 42d Street, went out a youngster and came back a star. "Nixon, you're going out a youngster but you've got to come back a star!" "Now, take off the dress and lose the hat. You look ridiculous." Whatever the critics may have thought the footlights agreed with him. "One day in 1938, Mrs. Lilly Baldwin, the director of the local amateur theatre group, telephoned me to ask if I would like to play the part of a prosecuting attorney in their upcoming production of Ayn Rand’s courtroom drama, The Night of January 16th. I took the part and thoroughly enjoyed this experience in amateur dramatics" (RN, interview cited by Nixon Foundation). This choice little piece of ephemera is being offered by Between the Covers as "The PERFECT gift for conservative objectivists." Liberal subjectivists may conscientiously object; it's the perfect gift for the Leftie in your life who needs a good laugh. We leave you with Our Man Flint's bravura turn as Man On The Ropes; afterward, he was in like Flynn, without the sexual connotation, of course. [NIXON, Richard M.]. [RAND, Ayn]. Whittier Comunity Players Present "Night of January 16th" by Ayn Rand. Woman's Club House, October 20 and 21, 1938. Seventeenth Season, First Production. Whittier [California]: Whittier Community Players, 1938. Program for the play. Program images courtesy of Between The Covers, with our thanks. Nixon one of my best!!! Hey Kids, Viva La Revolucion With Fidel And Che!